Starring: Gerard Butler, Lena Headey, Dominic West, David Wenham, Vincent Regan, Michael Fassbender. 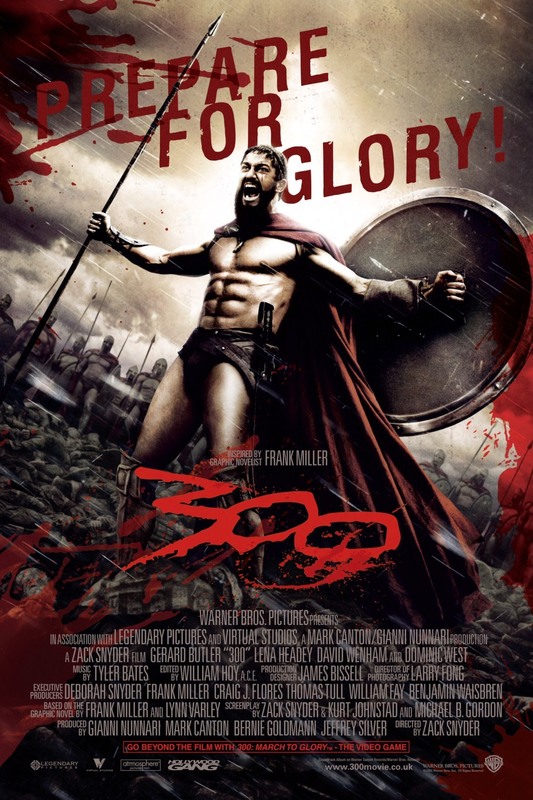 With the release of 300: Rise Of An Empire, time to revisit and possibly re-evaluate Zack Synder’s original 2006 blockbuster. I say possibly because when I saw it all those years ago, I have to admit I wasn’t a fan. I admired the visuals and general look of the film but everything else was tiresome, brutish and empty. Would having time away and preparing myself for the sequel change my point of view? Actually, no. King Leonidas, protecting the honour of his Spartan city and his wife from the Persians, sets out to take the empire on with an army made up of 300 brave warriors. Hold up in a mountain corridor that leads to his home, Leonidas and his men face impossible odds, fighting a force led by the giant Xerxes. Based on Frank Miller’s celebrated graphic novel, this film does the honour of being totally faithful to the book, in every sense of the word. Director Zack Synder has almost produced a frame-by-frame reprint for the big screen. It is a complete visceral experience and one that deserves praise. Created with a mix of CGI and lighting effects, it looks, feels and breathes like a graphic novel. Released a year after Sin City, another Frank Miller adaptation, both films have pushed the boundaries of cinema’s visuals, showing that you can do more than just point a camera if you have the imagination and, more importantly, the source material. So why don’t I like it? The film has a massive following and I do apologise to the fans but I find the whole thing a very empty experience. Living in a culture of video games, it feels like you are playing one of these games but have no control of the characters. At almost 2 hours long, it’s just one long battle after another, mainly in slow motion. You can only take so many decapitations, stabbings, limb lopping without thinking to yourself, there has to be more to this movie. There’s not. We get a few minutes of shouting and macho bonding and we are off again…and again. The characters are one-dimensional. The cast, made up of some talented actors, deliver their lines like some Wrestling war-cry. The moments of quiet act as a buffer because you know that seconds later, they’ll be back to screaming again. Surely it doesn’t do their throats any good. The worse culprit is Gerard Butler as Leonidas. His famous “This is Sparta!” cry is the level that he plays almost every line. With his computer generated six-pack, you learn very little about this leader apart from his blood lust. Lena Headey, as Leonidas Queen, does bring the volume down but she is far too talented an actress to be starring in films like this. Oh, and there’s a young Michael Fassbender before he proved he was a strong screen presence. What also annoys me is the impossibilities that they break. Firstly, where did they get their helmets from? The Spartans, dressed in capes and Speedo’s, carrying shields, suddenly have heavy, feathered-clad helmets. How? How can a giant platform with Broadway style stairs, clad with throne and 8 foot giant, be carried by anyone, let alone thousands? The most shocking thing is the fact that the Persians all seem to be deformed in some way, as if they could only be part of that army unless they were looked upon as being different. I know I will be criticised by those who look upon this film fondly but the point of being a critic is to share a point of view. My point of view. I didn’t like it when it first came out and I still don’t. Make a film with heart, with passion, with a soul and I’m happy. Make a film full of visuals and nothing else and I’m not impressed at all.